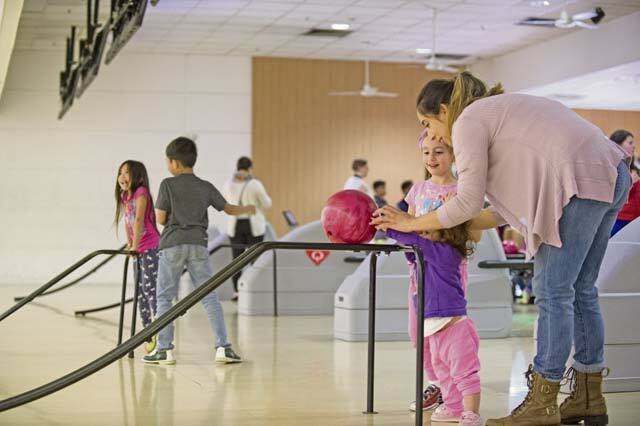 A Team Ramstein mother helps her daughter push a bowling ball down a ramp during the Deployed Family Dinner at the Vogelweh Bowling Alley on Vogelweh Military Complex, March 28. Approximately 40 family members attended the event. The 86th Force Support Squadron Airman and Family Readiness Center held a Deployed Family Dinner and bowling night at the Vogelweh Bowling Center on Vogelweh Military Complex, March 28. 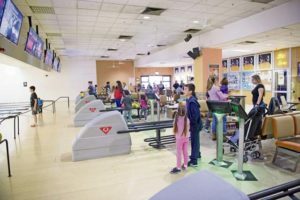 A Team Ramstein child bowls during the Deployed Family Dinner at the Vogelweh Bowling Alley on Vogelweh Military Complex, March 28. The 86th Force Support Squadron Airman and Family Readiness Center paid for dinner and bowling for approximately 40 family members of deployed service members. The monthly event gives families of deployed personnel a chance to meet with other families who are experiencing the same challenges caused by deployment, build friendships, and develop support networks, said Master Sgt. Peter Krueger, 86th FSS A&FRC senior noncommissioned officer in charge. 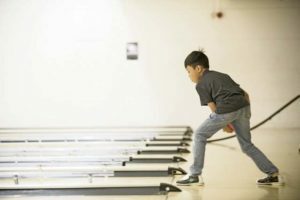 The A&FRC provided each family with a free dinner and free bowling for two hours during the event. The A&FRC works with volunteers and private organizations to assist with the dinners. Team Ramstein members bowl during the Deployed Family Dinner at the Vogelweh Bowling Alley on Vogelweh Military Complex, March 28. The 86th Force Support Squadron Airman and Family Readiness Center hosts monthly events for families of deployed service members to spend time with families in similar situations. Before the bowling started, Col. John Zapata, 86th Mission Support Group commander, thanked families for attending and for taking on the additional burdens while their loved ones are gone. Next month’s event is scheduled to be held at the Vogelweh roller rink, Krueger added. For more information or to RSVP for events, call the A&FRC at 06371-47-5100.